In the early years of Florida fruit shipping, the “old timers’ would add a jar of their own orange blossom honey or homemade marmalades to “sweeten” the gift. Guess what? We still do exactly the same thing! 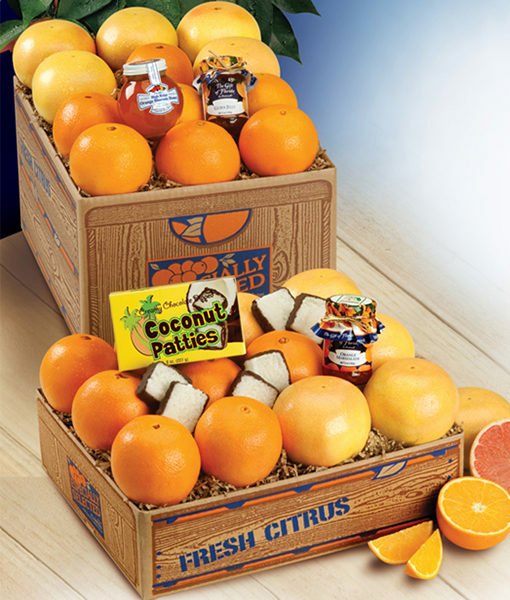 Along with our gift of Florida fruit, each gift contains a box of the creamiest Coconut Patties, hand-dipped in milk chocolate, a jar of 100% pure Orange Blossom Honey and two jars of our exclusive Jelly and Marmalade. And, you’II still hear those familiar “Thank You’s!” when they open their gift.